First, you should only have one feeder out when you are trying to photograph hummingbirds. If you are trying to photograph hummingbirds in flight, it should have no perches. Finally, you should dictate the birds pose by plugging all the holes in the feeder except the one you want the bird to feed from and then rotate the feeder to get the desired position. Sorry Mr. Hummingbird, I want your left side. Grass, leaf stems, toothpicks, flowers, tape. Don't let the bird dictate your composition unless you just don't care about the angle. 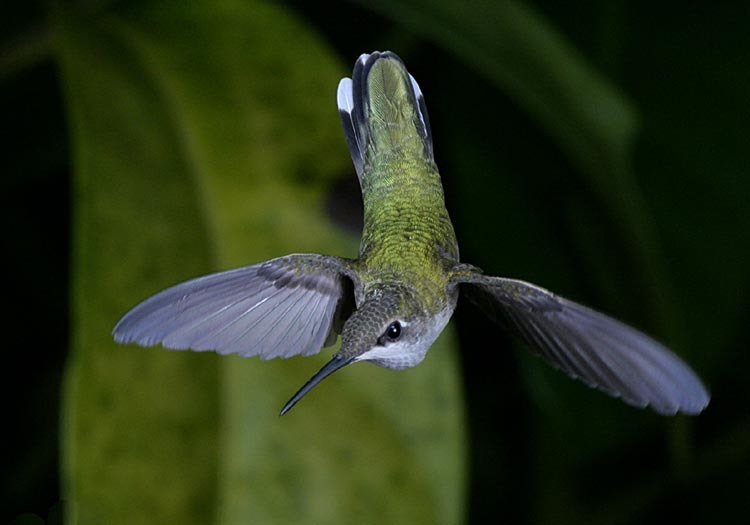 Hummingbirds can move frantically between flowers. To make them stay at the right flower, that one you pre-focused on, that one where the birds angle and the light will be just right, put some nectar in it. Yep, add a little sugar water. The easiest way to do this is to go to a veterinary supply store and buy a syringe used to vaccinate dogs or large mammals. Grind or file the sharp point off, fill it full of sugar water and dispense some into the flower you want the hummingbird to drink from. When the hummer gets to that flower, he will usually stop and sip a while, giving your lens enough time to get good focus and giving you enough time to get a few shots. This method can also be used to get hummingbirds to visit certain flowers more often, in case they have been neglecting your photogenic hibiscus in favor of your butterfly bush. 3. Dammit, move away from the feeder! If a bird sticks his beak in a feeder and won't move, go ahead and shoot once. The flash will usually make the bird "back up" to see what is going on. Then snap again. This is the pattern that most hummingbirds repeat at the feeder. Learning to anticipate it will allow you to get shots of the flying hummer without its beak in the feeder. If you get really good or lucky, you can get decent shots as the bird makes a mini dive to go back to the feeder. Learning the birds patterns will make you realize that you can get the bird in focus in more positions than perched or with his beak in the feeder. Hang a flower pot near where you usually keep your feeder (or put one on a stool) and use the syringe method to put nectar into the flowers or hang a long tube with a feeding tip that comes out just behind a supplied flower and photograph the bird feeding from the unseen tube. Get an "outhouse" type portable blind (also called a "hide"). I own one that was manufactured by a company called Ameristep. This blind can literally be set up in about 1 minute with the anchors or about 10 seconds without (you can literally throw it up in the air and it will be open when it lands). Place it between the feeder and the sun in the late evening and you won't even have to worry about the feeder being in the shade. I use the blind when using a 200mm lens to take images from about 36 inches away from the feeder. The only thing visible from the blind is the lens. Make sure and put the blind up at least a day before you take the photos so the birds will be used to it being there. Leave it up as long as the birds stick around if you can get away with it. I leave mine up for a week at a time. Motion is what startles hummingbirds. They will tolerate sound more than most people think. I have carried on normal volume conversations while photographing hummingbirds with no reaction from the birds. But if I move, the bird will usually take notice. If I am in a blind, I can scratch my nose, stretch or make any movement I want to and still not startle the birds. BUT, PLEASE NOTE, IF YOU KEEP STILL, YOU DON'T REALLY NEED A BLIND. My most consistent problem is getting a good background. Since the background is out of focus, you can simply paint any background you want onto poster board with spray paint and use a separate flash to illuminate it. Orange flowers and green background, no problem, Krylon makes those colors and since it will be out of focus anyway, a green poster with not-too-neat orange blobs will do just fine. Another method is to set up your feeder about 3 feet in front of your favorite plant. Invest in a sturdy monopod or tripod, I use a monopod. This will allow you to keep the camera at your eye for hours on end and will be helpful whether using a blind or not. If you let the camera hang from a neck strap and bring it into position when the hummingbird flies up, you will miss shots. This is one that I have heard, but cannot substantiate. 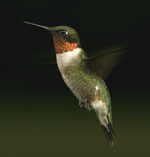 Some claim that the more dilute the solution, the more frequent a hummingbird will visit the feeder. The more concentrated, the less often the bird will visit. I have never mixed nectar that strong. My aunt claims wild success with 3:1. I have heard of people using a 2:1 solution. I use somewhere between 4:1 and 3:1, tending a little closer to the latter. You will probably eventually read that anything but 4:1 will cause instant death to hummingbirds. Do not trust people who claim anything of the sort. Hummingbird watchers are a very superstitious breed. 10. Don't shoot 'til you see the whites of their eyes . . .
Don't be impatient. When the hummingbird approaches the feeder, let it sip once before you snap. In my experience the hummingbird will be a little more tolerant of your flash if it has already hit paydirt. Also, wait until focus is correct and the bird is in full view. Remember, each flash has the potential to make the hummer end his visit. He will come back, but if you continue to scare him with flash before he drinks, he will give up on the feeder. If you aren't using flash, shoot away. Use of a "Remote." On film cameras, a cable release, and on newer cameras, a remote shutter release, are primarily used for photographs where vibration reduction is very important, such as landscape photography, for long exposures or when using very long focal length lenses with shutter speeds that are less than one divided by the focal length of the lens. For photographing hummingbirds, the only well-focused photographs that you will likely get of a hummingbird will be of one sitting at the feeder because the lens will have to be pre-focused on a fixed spot. 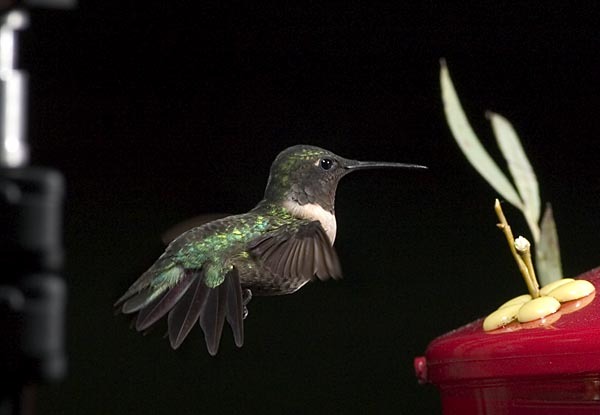 I think that the reason that people want to use a remote release with hummingbirds is so that their presence, close to the feeder, won't prevent the birds from feeding. For this purpose, a remote is simply unnecessary. As long as you remain still, birds will feed even if you are within a few feet of the feeder. Building an extravagant blind. Blinds are necessary only to hide your motion from hummingbirds. If you can remain still, you don't need a blind. If you want a blind, the cheapest one you can find will probably do.